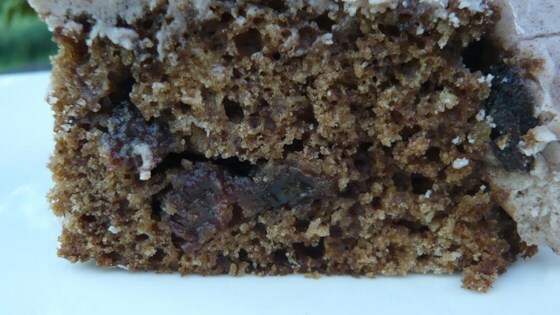 "This is a dark cake, moist and spicy with raisins. It is also known as Wartime Cake." In a saucepan, combine brown sugar, water, raisins, shortening, nutmeg and cinnamon. Bring to a boil, and continue boiling for 3 minutes. Remove from heat and allow to cool. Preheat oven to 350 degrees F (175 degrees C). Grease and flour a 9 inch square pan. Sift together flour and baking powder. Bake for 45 minutes in the preheated oven, or until a toothpick inserted into the cake comes out clean. I HAVE MADE THIS FOR YEARS AND I ADD THE CANDIED FRUIT [AS FOR FRUIT CAKE] AT CHRISTMAS TIME AND IT MAKES A WONDERFUL MOIST FRUIT CAKE.